What kind of pet is extraordinary enough to be a VIP Mutt? Your pet has changed your life, in ways both big and small. VIP Dog Teams is changing the lives of people with special needs in Ventura County. 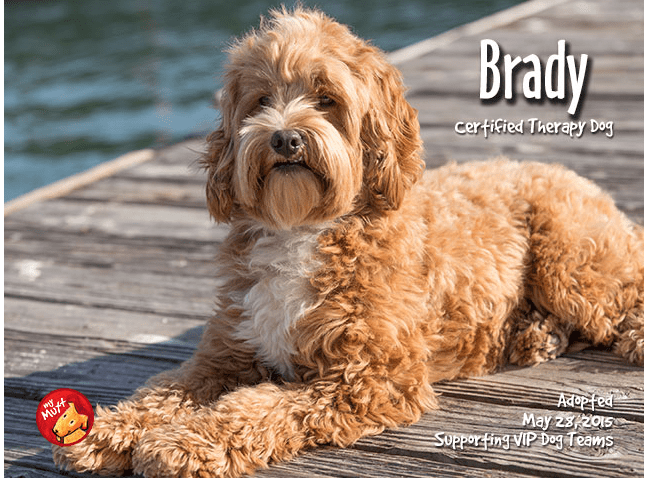 Your donation can help train therapy dogs to assist those with special needs to gain greater independence in the world around them. We are taking part in Pet Food Express' My Mutt poster program. When you donate money to VIP Dog Teams and share the receipt with Pet Food Express, they will celebrate your gift with a My Mutt poster of your pet displayed in one of their stores. Donate $250, $500, or $750 to VIP Dog Teams and we will send you a receipt. This receipt must be turned in to Pet Food Express to have a professional picture of your mutt taken and put up in one of their stores for 6 months to a year. The instructions for uploading a donation receipt for Pet Food Express can be found at their website. Despite its My Mutt name, any animal can appear on a poster: dogs, cats, hamsters, horses, birds – you name it! And of course, purebreds are included as well. Donations must be within the twelve months preceding the My Mutt application and must be in addition to adoption fees if the donation is occurring at the time of pet adoption. Your donation should be sent directly to VIP Dog Teams, not Pet Food Express. Pet Food Express just needs proof of your donation via a receipt. Unfortunately, Pet Food Express cannot guarantee store location or placement inside or outside of the store of your choosing, but they will do their best to place it there. We will email you a receipt once you've submitted a donation below. Then head to Pet Food Express to submit your donation information by clicking here. Don't forget to submit your donation information to Pet Food Express or you pet won't qualify for pictures! Finish the process on Pet Food Express website here.